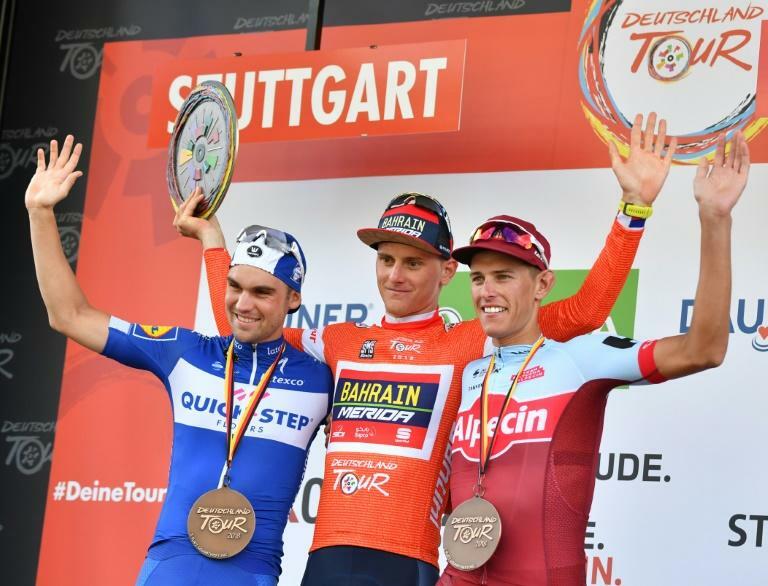 Slovenia's Matej Mohoric was crowned the overall Tour of Germany champion on Sunday after finishing second behind home favourite Nils Politt in Sunday's fourth and final stage in Stuttgart. It was second stage-race win in a fortnight for Mohoric, 23, who won Saturday's stage in Merzig to take the red jersey, following victory last weekend on the four-day BinckBank Tour through Belgium and the Netherlands. Politt, 24, earned the first stage-race win of his career by covering the 207.4 kilometres from Lorsch to Stuttgart in four hours, 49 minutes, 20 seconds with Mohoric finishing close behind. Tour de France winner Geraint Thomas finished 52nd on Sunday, 2min 30sec behind Politt, coming 41st overall, but the Welshman's presence in Germany boosted the race's profile on its return after a decade-long absence. Maximilian Schachmann, who won Friday's second stage after beating Mohoric on the line in Trier, took second overall with Politt third. Enthusiastic crowds greeted the riders as the Tour of Germany returned following a ten-year hiatus after the 2009 edition was scrapped following a series of high-profile doping cases, which blighted cycling. "It's amazing, the number of spectators is great. Cycling is not dead in Germany," beamed Berlin-born Schachmann. Organisers ASO, who are also behind the Tour de France, want to make the German race a regular fixture on the cycling calendar with plans to make the race a nine-day event in the coming years. "The atmosphere is right, the performances were right, even from the German riders, which gives us courage for the future," race director Claude Rach told SID, an AFP subsidiary.